October is Pinotage month and I’m celebrating this proudly local blend with two of Bellingham’s excellent wines as part of a recipe pairing. But first, why is Pinotage such a special wine to South Africans? In short, Pinotage belongs exclusively to us, having been created back in 1925 by Abraham Izak Perold – the first professor of Viticulture at Stellenbosch University. Made from a blend of Pinot Noir and Cinsault grapes, Pinotage possesses a smoky earthiness that provides the varietal’s signature sapidity. Love it or hate it, Pinotage has been praised as being the ideal red wine to match with another national icon – braaied meat. Skillfully pairing with rich red meats like beef, pork and lamb, Pinotage’s smoky notes compliment the particular flavour provided by cooking over coals. It also makes for good company with spicy Malay dishes like bobotie or a fiery Durban curry. Unquestionably a New World wine, Pinotage is not dissimilar to its country of origin – thoroughly unexpected, exciting and made to be shared with friends. In celebration of this unique varietal, I developed a recipe inspired by one of my personal favourite Pinotage producers – Bellingham Wines. A name to be reckoned with in wine since 1693, the farm now prides itself in its classic New World winemaking philosophy, with head winemaker Richard Duckitt at the helm. 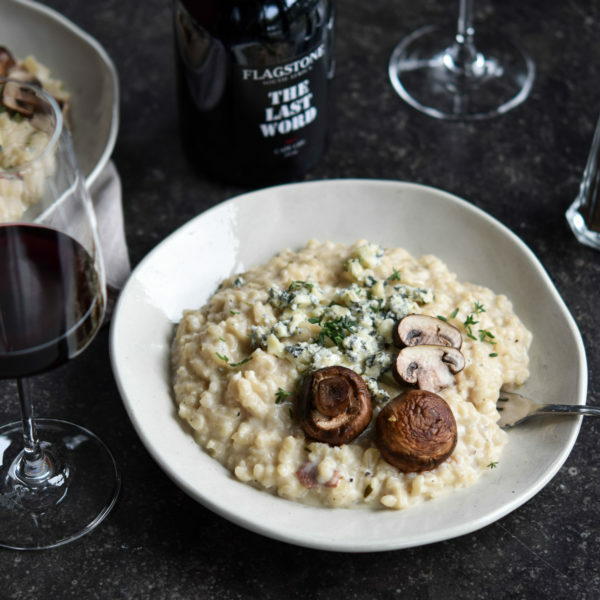 Coming from two of the Bellingham’s most renowned ranges – the Bellingham Series and the Bernard Series – I sampled a Pinotage from each and was so inspired by both that I developed a recipe that would pair equally well with either wine. Wanting to embrace the marriage of Old and New World wines that Pinotage is known for, a classic dish with a twist was needed. Enter my Browned Butter Pork Steak with a creamy tonnato sauce. Beautifully marbled pork neck steaks are tossed in seasoned flour before being fried in a decadent browned butter sauce flavoured with bay leaf. The crispy, golden pork steaks are then bathed in a simplified version of Italian tonnato sauce – a creamy emulsion infused with anchovies and garlic. During cooking, the anchovy fillets melt into the sauce, leaving a savoury warmth without the fishiness. To serve alongside the pork, simple hasselback potatoes roasted until crisp and lightly steamed greens to cut through the richness of the dish work best. This combination of texture and taste is best paired with either the Bellingham Series Pinotage 2017 or their limited release Bernard Series Bush Vine Pinotage 2016. Using a meat mallet, flatten the pork steaks slightly. Add the flour and a good grind each of salt and pepper to a bag and, working one at a time, toss the flattened pork steaks in the mixture. Heat the melted butter in a large skillet until it bubbles and begins to brown. Add the bay leaves and garlic slices to infuse into the butter, removing them as soon as the garlic goes golden. Keeping the butter bubbling hot, shake off any excess flour and fry each pork steak until golden brown and crisp. Don’t worry if they are still slightly pink inside as they will be finished off in the oven while the tonnato sauce is being made. Place the fried pork steaks into a dish lined with paper towel and place in a preheated 150°C oven to keep warm until needed. Be sure to not leave the steaks in the oven for longer than 10 minutes. Combine the first three ingredients in a small saucepan and simmer over medium heat until reduced and thickened. Add a grind of pepper, remove from heat and leave to stand to let the flavours develop. Preheat the oven to 220°C. Using a sharp knife, cut slices along the top of each potato, being careful to not slice right through. Arrange the sliced potatoes in an ovenproof dish and drizzle over the olive oil. Season with salt and pepper, cover the dish with foil and bake for 30 minutes before removing the foil and baking for a further 25 to 30 minutes or until the potatoes are golden and crispy on top. Serve the pork steaks on warmed plates with the tonnato sauce spooned over the top and the hasselback potatoes and steamed greens (I love Brussels sprouts) on the side. Enjoy with three close friends and a glass or two of either one of Bellingham’s superb Pinotage offerings. Michael, if you had taken the time to read my recipe properly, you would would have noticed that I purposely exchange tuna for anchovies – a far tastier fish. “The crispy, golden pork steaks are then bathed in a simplified version of Italian tonnato sauce – a creamy emulsion infused with anchovies and garlic. During cooking, the anchovy fillets melt into the sauce, leaving a savoury warmth without the fishiness”.